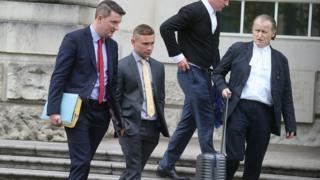 Former world champion Carl Frampton has dishonestly claimed ex-manager and promoter Barry McGuigan withheld earnings, the High Court heard today. Counsel for Mr McGuigan accused the Belfast fighter of lying about profit arrangements in a bid to blacken his client's name. Lawyers for Barry McGuigan deny all of the allegations. Frampton split from Mr McGuigan's Cyclone Promotions in August 2017. The court heard that by that time, the boxer believed Mr McGuigan was "ripping him off and concealing it". Nicknamed 'The Jackal', Mr Frampton is facing action from his former promoters for alleged breach of contract. The Tigers Bay-born fighter is counter suing on a number of grounds including an alleged appropriation of fight earnings and a breach of the terms of an International Promotional Agreement. Image caption Carl Frampton said he feels he was 'fobbed off' over pay after he defeated Scott Quigg in 2016. During the initial hearing on jurisdiction it was alleged that Mr Frampton's deteriorating relationship with his former manager and promoter ended after the taxman called at the boxer's home about a company VAT bill for almost £400,000. Mr Frampton also said the cracks first appeared when he was allegedly "fobbed off" about being paid after defeating rival Scott Quigg in February 2016. The McGuigan's lawyer Liam McCollum said his clients rejected all of the fighter's claims. He said: "The plaintiff... tried to advance the whole merit of his case, mostly in an attempt to blacken my client's name before the press". Image caption Carl Frampton split with Barry McGuigan's Cyclone Promotions in August 2017. "It will be our case that a lot of the contentions made by Mr Frampton are lies and dishonest," he said. Mr McCollum also argued that costs should be reserved until the end of the trial. However, Gavin Millar, for Mr Frampton, said it would be unfair for the fighter to have to wait to be reimbursed after securing the right to have his case heard in Belfast. He said: "The defendants have failed in their attempt to prevent us litigating here, and we should be entitled to the costs we have had to incur to get this litigation in this jurisdiction to the starting post." Mr Justice Horner reserved judgement on the costs issue.